Strikingly beautiful and intelligent, the Victoria crowned pigeon is a fascinating ground bird to watch. It's common to see them wandering around a zoo or aviary and their gentle nature makes many people wonder if they'd make good pets. In reality, this is not a bird for novices. Even pigeon fanciers and experienced bird owners need to ensure they have the space and time needed to dedicate to these majestic creatures. Originally from New Guinea and introduced to nearby islands, the Victoria crowned pigeon has been bred in captivity for hundreds of years. They're a common sight in the United States and the United Kingdom at zoos and aviaries, though they are somewhat rare in the pet bird trade. This bird is the largest living pigeon and the closest remaining relative to the extinct dodo bird. It was named in honor of Queen Victoria and its flashy blue crown of intricate lace-like patterns, as well as its poise, do give it an air of royalty. In the tropical rainforests of New Guinea, Victoria crowned pigeons had been widely hunted for their meat and feathers. Due to this, as well as habitat destruction, the wild populations were declining rapidly and endangering the species. In a 2016 update, they have been moved from "threatened" and "vulnerable" to the "near threatened" category because hunting has decreased but deforestation continues. Victoria crowned pigeons can reach lengths of between 28 and 30 inches from head to tail. To put this into perspective, it's nearly as large as an adult female turkey. They are much lighter though. The average weight of the pigeon is about seven pounds where a small turkey can easily top 15 pounds. It is said that Victoria crowned pigeons can live up to 25 years in captivity when provided a healthy environment and proper care. Victoria crowned pigeons are known to be intelligent and quite easy to tame. This bird is docile by nature, which is why they're a common attraction at zoos and often left to roam the grounds freely. They tend to be happiest when foraging for food on the ground and wandering about. The call of this pigeon is unlike breeds you may be used to. Rather than the soothing pigeon "coo," Victoria crowned pigeons let out more of a hollow "boom" that can be quite thunderous and surprising. This bird can fly short distances but will generally only do so when absolutely necessary. This is usually when they are startled, in danger, or in need of a high roost in the trees for the night. 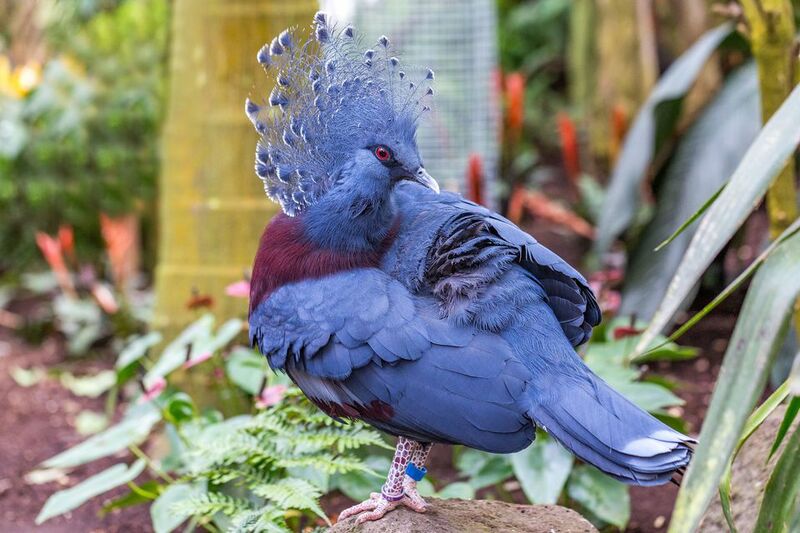 A stunning bird, Victoria crowned pigeons sport powdery blue feathers on their bodies, with red eyes, a dark mask, and maroon breasts. They display a lighter shade of blue on the wings and in a band on their tailfeathers. The crest is a beautiful display of dark blue lace with vivid white tips. This gives them more of a peacock look than a pigeon. It's also a monomorphic species, so males and females look alike. A male may be slightly larger than a female, but it's barely noticeable. Victoria crowned pigeons spend quite a bit of time on the ground and need plenty of room to run around and exercise. In fact, it is recommended that they are allowed a minimum of 200 square feet of space in their enclosures. They should also be provided with roosts at various heights. These pigeons tend to do best as a pair in a single flight (enclosure). Males will fight each other during the breeding season and one that is kept without a partner may become lonely. The males put on quite the show in an elaborate courtship dance. A mating pair will only produce a maximum of three eggs each year. Both the male and female incubate the eggs, which take around a month to hatch, and raise the young squabs. Despite their docile personality, this is not a low maintenance bird. Since they forage, the enclosure needs to be cleaned regularly so they don't eat droppings along with food, which can cause health issues. Keep in mind that the birds are native to a tropical climate and will do best in warm, humid regions. They cannot tolerate temperatures below 40 F. If your region gets cold, you'll need to figure out how to provide heat. The flight should also protect the birds from wind and rain. Victoria crowned pigeons generally tolerate birds of other species quite well. It is often best when they're the only ground bird. Keeping the pigeons with a busy flock of chickens, for instance, will only stress the pigeons because they're used to a calm environment. On top of being a ground-loving species, they are even larger than many hookbills. These space requirements can be hard for even the most dedicated enthusiast to meet. In other words, if you can't provide your bird with a flight the same size as the average bedroom, then you should not consider adopting a Victoria crowned pigeon. While these pigeons may be more obscure than other bird species, there are a few aviaries left in the U.S. that breed and offer them for private sale. If you can provide for the bird's needs and have your heart set on one, keep looking. Chances are that you will find one eventually. Be prepared to pay a hefty price because a pair can easily run a few thousand dollars. Like all pigeons, Victoria crowned pigeons feed on the ground. In the wild, their diet consists mainly of fallen fruits, seeds, grains, and small invertebrates. They're particularly fond of figs. Captive crowned pigeons do well on a high-quality seed and grain mix and many keepers stick with a standard dove mix. They should also get regular servings of fresh fruits and vegetables. Like most pigeons, these birds need plenty of room to exercise, stretch their muscles, and play. They will entertain themselves and stroll around the flight foraging. You can encourage this habit by strategically placing their food and offering them a variety to get excited about.